The NASA and contractor workforce at the shuttle’s backup landing site, the Dryden Flight Research Center, are completing preparations this week to support Monday morning’s launch of STS-131. If the Californian option is required, Discovery will land on the temporary concrete runway 22/04 – which became the topic of a managerial debate during STS-130 due to its flooded PAPIs (Precision Approach Path Indicator lights). The team at Dryden manages vehicles, equipment, facilities, and aircraft – which are used to assist the Shuttle crew and mission operations team in landing the orbiter safely and successfully, taking care of the vehicle, crew, and payload following landing, and preparing the orbiter for her return to the Kennedy Space Center. Dryden, which is located adjacent to Edwards Air Force Base, was the prime Shuttle landing site during the early part of the Shuttle program. 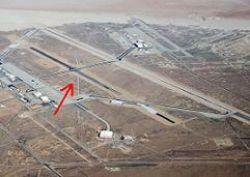 Edwards has concrete and dry, lakebed runways that are equipped by Dryden for Shuttle landings. It also has the same convoy of landing support vehicles and equipment brought in immediately after landing as Kennedy Space Center. These help to keep the vehicle safe for ongoing work and operating within requirements. A few days before launch, a team from KSC, led by the NASA Convoy Commander (NCC), arrives to operate the convoy equipment, execute post-landing procedures, and “turnaround” the orbiter for her ferry flight back to KSC. 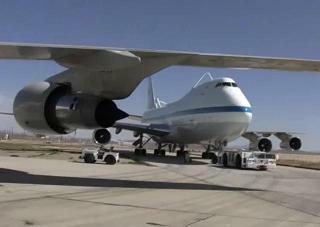 The specially-converted Boeing 747 Shuttle Carrier Aircraft and related ferry hardware, such as the aerodynamic tailcone that fits on the aft-end of the orbiter, are currently at Dryden, ready for a possible Shuttle landing there. Dryden also has the facilities necessary for turnaround, such as the Mate Demate Device, which is used for deservicing the orbiter and lifting onto the SCA. Prior to launch, the team at Dryden ensures that the facilities, vehicles, and aircraft there are ready to support a Shuttle landing. Required, preventative maintenance and pre-landing checkout work are managed so that they don’t interfere with landing support, which usually begins two weeks before launch. NASA’s Shuttle and Flight Ops Support Office at Dryden is headed by George Grimshaw, Susan Ligon, and Lance Dykhoff. Contractors that maintain the assets there include United Space Alliance, Lockheed Martin, Computer Sciences Corporation, and Kay & Associates. Most of the facilities and equipment at Dryden have their own maintenance schedules, which are worked around Shuttle mission support. Grimshaw noted that some annual maintenance for the Mate Demate Device (MDD) is normally done in January, but given the timing of the STS-130 mission in early February, that work was done early. 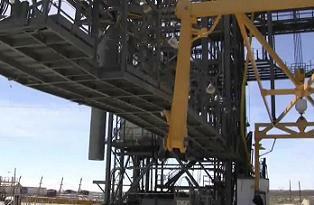 “The one that we try to get every January is the MDD and doing the load testing on the cranes for that,” he added. “This year we knew we had the mission coming in February; I think it’s more toward the middle or the end of January when that (MDD preventative maintenance) is due. Our guys were starting to work and get all that together over Christmas vacation. That way when we came back to work, everything would be set in place. As Grimshaw noted, fourteen days before scheduled launch, a freeze goes into effect to avoid changes that might prevent the site from being ready to support the upcoming mission. “When we enter that fourteen days before launch (time period), then there’s an IT freeze that comes on, a range freeze, and a facilities freeze – so facilities doesn’t do any digging or any type of work that could possibly cause any type of infrastructure problem that would put us out of position to support (the upcoming mission),” Grimshaw explained. Ahead of landing, a Site Readiness Report is prepared for the NCC – who arrives on site from the Kennedy Space Center prior to launch with a team of about thirty people. “What I do is what I call our Site Readiness (Report), which is a document that I take around to all the areas – security, facilities, IT personnel, Air Force personnel, Public Affairs personnel, Photo Lab, Video, Comm, the Director – everybody in the whole center has something to sign, stating they are ready to support Shuttle operations,” noted Susan Ligon, Deputy of the Shuttle and Flight Ops Support Office. “In that (report), I have four areas that I send out copies of what we did last time, saying ‘this is what we reported out last time, please update and correct any dates, configuration, and get back to me by such-and-such a date.’ I have to have that completed, signed, and approved by George before the NCC arrives on site. Ligon also explained the contractor responsibilities for reporting their readiness for landing support. “Lockheed (Martin) has a very large portion of it – all the runway lights, PAPIs and ball-bar, MSBLS (Microwave Scanning Beam Landing System) systems on all the runways,” she added. Both NASA 911, one of the Shuttle Carrier Aircraft (SCA), and Tailcone Number 2 are ready to support Monday’s launch. 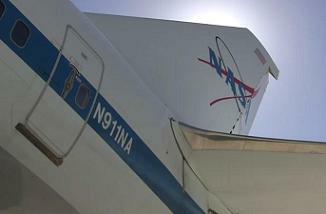 At present, the aft attach ball mounts are not installed on the NASA 905 aircraft; however, it can be brought back to ferry condition, when necessary. Rick Brewer, Team Leader for Computer Sciences Corporation (the company that maintains the SCAs) at Dryden, said that the aircraft are generally flown at least once a month to provide proficiency training for flight crews. Typically, Brewer said that training flights will carry between two and four pilots and one to three flight engineers. 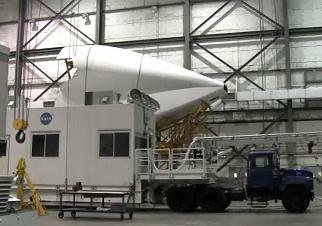 Tailcone 2 is currently set up in the Shuttle Hangar at Dryden, along with a few other convoy vehicles parked in the hangar at the time – such as the NASA Convoy Commander vehicle, the White Room, the Tow vehicle, and the Cooling vehicle. 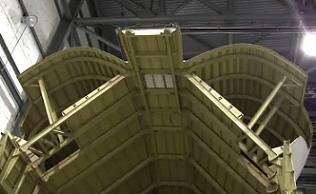 The tailcone consists of six pieces that are assembled at Dryden for ferry flights that originate there. “So what happens is, we bring in the fixture over here that we call ‘the grey whale.’ We assemble the upper section on top of it and we assemble the lower section here on top of what we call our 704 stand. “The first piece will be the lower section, that will be on here (704 stand) and it will be pinned, and then you will usually put on your right-hand side panel and your left-hand side panel, you put all your bolts in and do all your torques, all your cross-members and such, then you’ll go over and build your upper portion. After a ferry flight and after the tailcone has been removed from the orbiter, it is disassembled, placed in boxes, and shipped back to Dryden via ground transportation. Tailcone 1 is also currently at Dryden, although in pieces in the tailcone shipping boxes, disassembled. As with STS-130, should a nominal end-of-mission landing occur at Edwards for STS-131, it would happen on the “temporary” concrete runway, Runway 04L/22R – also known as the “inside runway.” The main concrete runway, Runway 04R/22L (the “outside” runway), is undergoing another period of maintenance. NASA has almost all the navigation aids to support both runways, with the exception of the MSBLS unit on the Runway 04 end. “Once we got everything set up and we got additional equipment from Kennedy, we only have to move the MSBLS system from the (Runway) 04 end back-and-forth,” Grimshaw said. “We have systems on the 22 end that stay in place that don’t move back-and-forth, we have spare PAPIs and ball-bar lighting. Even after we move back (to the main runway), the inside runway will remain intact, we’re not going to move that stuff off of there, unless we have to move something off for maintenance. It will stay up as a ‘just-in-case’ type of thing. “The other thing with that is, with that equipment already out there, if you were to need a spare because something on the main runway (was broken), it’s already there, you can just drive over and pull what you need. And that way we’re not jockeying pieces of equipment around. It’s already set up, it’s already NOTAM-ed, and the Air Force is already aware of it, and it just makes more sense. 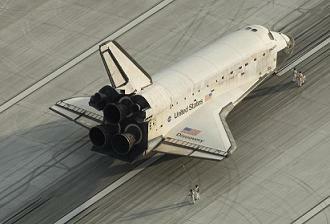 As noted by NASA, the current plan is to switch back to the main concrete runway before STS-132’s current schedule. “Our plans right now are, we (STS-131) land on the 18th (of April), the MSBLS guys come back in and start their move on the 19th, we’ll have it relocated and back on the main runway in time for the STAs (Shuttle Training Aircraft),” Grimshaw added. Grimshaw also explained that they will recertify the MSBLS systems for both ends of the main runway before STS-132 is officially cleared to land, should that option be required. “(Since) it’s a two-year recert, (and the 04 end) is going to come due (because of the move), we might as well do both ends, and now moving back to the other runway, even though the 22 system is good until I think May of 2011, we decided we’re going to do both ends of the runway when we move back. An example of the challenges the Dryden team is sometimes faced with occurred before the last mission, STS-130 – when the PAPI lights found themselves under water at the end of runway 22. “(On) the last mission, the lakebed was wet and the PAPI lights on the temporary runway – well, both runways, both 22 runways – were under water,” Grimshaw noted. “There are two sets of PAPI lights for the Runway 22 end of both concrete runways. Those lights are located 6500 and 7500 feet from the end of the runway threshholds – out on the dry lakebed. “So we have this water and I reported back to them (Landing Support Office at JSC) that the lakebed is ‘red’ – we have no access out to those PAPI lights – and I’m trying to find the airboat (previously used by predecessor Charlie Baker). Those guys said ‘well, we don’t know,’ and talking to my counterpart, Dean Schaaf back at KSC, and he’s not sure. “We were trying to figure out where this thing is at and I get an email from Norm Knight (ascent/entry flight director at JSC) that says ‘George, I need positive confirmation that we will have PAPIs up and operating before launch.’ Of course I can’t go back to him and say ‘well I can’t give you that’ – so I told him right now we’re in a search to try and find the airboat, we have no access to the lakebed. 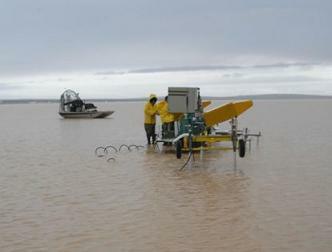 “Two days before scheduled launch, we found the airboat, we got it here, and got it out on the lakebed, and the guys found that one set of them (the PAPI lights) was inoperative. They came out Saturday morning (February 6th) and fixed all that. During this whole time, I’m sending emails to different people – to the ferry flight manager, Don McCormack at JSC, to the LSOs (Landing Support Officers), to Norm Knight, and to Dean (Schaaf) on what our status is. This was obviously appreciated, as the Dryden team recently received a group achievement award from JSC for their work to get the inner PAPI lights on Runway 22R ready to support the mission.